Let’s say you recently penned Captain America: Civil War, an exceedingly successful comic book franchise effort weighed down by the mushrooming of heroes. So. Many. Heroes. And let’s say it went so well that you are now tasked with the new Avengers movie—the film that takes very nearly every hero from your last effort and tacks on, say, 7 or 8 more. You would almost have to immediately think about thinning the herd, right? Christopher Markus and Stephen McFeely (who’ve penned all three Captain America films) weave a Marvel Universe-spanning tale that asks whether or not things would work out better if we had about half as many people to deal with. That seems like writerly self-reflection right there. Thanos (Josh Brolin, who villains it up for Deadpool 2 next) believes in balance. He’s been collecting Infinity Stones across all the different Marvel movies so he can create this Justice Friends adventure and rid the universe of half its inhabitants. Wait, Thanos is a Guardians of the Galaxy villain, right? Does that mean Starlord’s entire rag-tag crew will join the Avengers (and Dr. Strange and Black Panther and Spiderman and on and on)? So, Chris Pratt, Chris Evans and Chris Hemsworth? All we need to defeat Thanos is Chris Pine. No way six Infinity Stones can outshine the wattage of all the Chrisses! The screenplay offers smart comic moments that suit individual characters (Drax! Teenaged Groot!) and never undermine the drama, of which there is plenty. And balance is clearly on the minds of the writers as well as directors Anthony and Joe Russo (who helmed the last two Captain American films and love Cleveland). The storyline divides up nicely to allow the plethora of personalities to shine, each in their own way. Though the film runs a full 2 ½ hours with the end-of-credits stinger, it never drags. Plenty happens, all of it rooted in character and held together by Brolin, who gives the film a layered epicenter through his memorable CGI/voice performance. The Thanos facial effects rank somewhere between Planet of the Apes and Superman’s mustache, while the outlying worlds and creatures sport satisfactory shine. But we cannot get behind what they’re doing with Hulk. Not digging it. The very best films in the Marvel universe excel in nuanced big thinking (Black Panther, Winter Soldier) or bullseye tonality (Spider-Man: Homecoming). 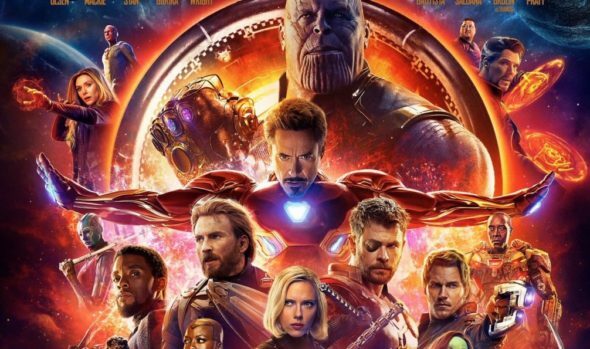 Infinity War gets close on both battlegrounds, but lays up to bet on its own long game. True, that sounds like cliched word salad, but we’re steering clear of planet spoiler. Infinity War tackles some big ideas and makes some brave choices that may cause you to reassess the entire Marvel franchise. Not everyone will be pleased. But props to Markus, McFeely and the Russos, for being unmoved by the Last Jedi fanboy uproar and following an ambitious vision. And their film does entertain. There’s not a minute of bloat and there is plenty of thought-provoking story likely to make this a movie earning more respect through time and space.